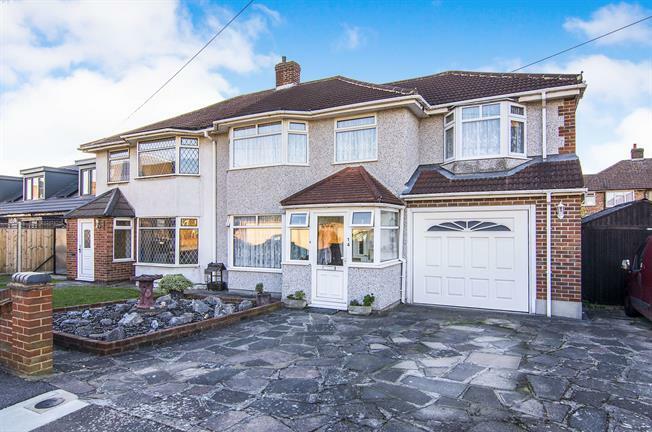 4 Bedroom Semi Detached House For Sale in Rainham for £435,000. This four bedroom semi-detached family home offers lots of living space, a large kitchen and a self contained annex. Located 1.3 miles from Elm Park Underground station and walking distance to local bus routes. There are numerous schools nearby such as St Albans Catholic School and Whybridge Primary School. Downstairs there is a large through lounge, with bay fronted windows and a feature fireplace. This leads to a dining area, with a lantern sky light. The kitchen is a good size, offers lots of cupboard space, a breakfast bar and access to the large garage. Upstairs there are four good sized bedrooms, some of which have built in wardrobes. There is also an extension over the garage, which is currently being used as a self contained annex. It has a bedroom, living room, kitchen and bathroom. Perfect for an older child or an elderly parent. The garden is low maintenance and is completely paved. To the front there is off street parking for up to four cars.